Today we showcase an exciting and a successful venture founded by Grant Simonds from Melbourne, Australia, MComms TV - a software solutions company that specialises in live Mobile TV monitoring, digital audio/video mixing, transcoding and Mobile TV Ad Insertion for the telecommunications industry. Their products are used by network operators and content providers globally to deliver innovative Mobile TV services to subscribers. • Please tell us about your venture/company? MComms Monitor enables video streaming operators to monitor the availability of multiple video streams on-screen and using SNMP traps. Provides a “Video Wall” for staff and customers to view available streaming content. MComms Transcode converts redundant live video streams from the internet, IPTV and analog/digital feeds into compatible Mobile TV video streams. A stream can be output simultaneously in multiple formats such as H.263, H.264, MPEG and Windows Media. MComms Ad Insert provides operators and content providers with a new source of revenue for Mobile TV. MComms Ad Insert supports manual and automatic insertion, replacement and banner advertising in live Mobile TV content for any handset! MComms Video Portal automatically generates video portal menus from live video streams in a single integrated software package with telco-grade features. 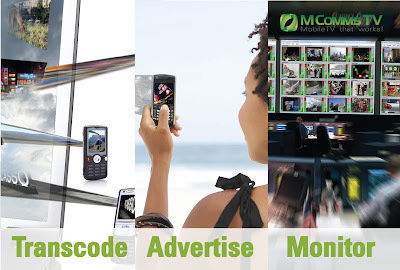 MComms Video Portal is used with video calling or channel changing applications. • Who are the people behind this and how it started? Grant Simonds founded MComms TV in 2003. Grant has worked with Mobile TV in Australia since its inception in 2001. Before founding MComms TV, Grant worked for Ericsson and Telstra as a manager for mobile video streaming solutions. During that time he has worked on mobile video streaming solutions with 3 out of the 4 Australian mobile network operators and a number of operators internationally. Some well know projects that he worked on include the first live Mobile TV streaming in Australia from the Big Brother TV show in 2004 and later Telstra’s live broadcast of the Commonwealth Games. Grant saw a gap in the market for specialised software for the Mobile TV industry and founded MComms TV to development new products that were sorely needed by Mobile TV providers. Initial products included MComms Monitor which helps operators view and test all the live MobileTV streams in their network and MComms Transcode which can convert live streams from almost any format into mobile compatible streams. Grant Simonds holds a Bachelor of Engineering in Communications with honours from RMIT University in Melbourne. • What is the main objective/mission behind your venture? MComms TV develops software for niche areas within the video streaming industry, our solutions are often used to fill the gaps between existing solutions from major vendors. • What type of customers you are targeting? MComms software is used by mobile network operators and content providers. • What are the main technologies used behind this venture? MComms uses patented technology for monitoring and manipulation of live video streams. • Are you using lot of open source tool sets for this? There is some open source software for converting video files from one format to another, but no open source software covert all the live video streaming formats required by mobile network operators. • What’s your thought on being an entrepreneur? How tough it is to start a venture in Australia? There are several barriers to start up companies becoming successful in Australia, I think the main difficulty is attracting early stage venture capital. MComms has been successful in attracting early stage investment. • What’s your thought on the start-ups culture and innovation coming out of Australia? Australians and Australian companies are highly innovative, but Australia can be a difficult environment to commercialise innovation because of our geographic locality, lack of government support and lack of investment incentives. • What do you think the government (federal and state) should do to improve the culture of innovation and the telecom industry?The loss of the Commercial Ready program this year will have a big impact on innovative businesses that are trying to bring products from the idea to realisation stages and this is the kind of program that provides good support and outcomes for innovation in the telecom industry. Thanks Grant for sharing your thoughts with us. All the best for future. This work is licensed under a Creative Commons Attribution 2.5 Australia License.